At the North American International Auto Show, Chevrolet took the curtains off its all new Chevrolet Cruze Hatchback 2017. The model is adorned with a handsome body while the cargo volume and increased power output adds to the gleam. Let us have a look at the review of Chevrolet Cruze Hatchback 2017 to know in detail about it. The interior of Chevrolet Cruze Hatchback 2017 is similar to the one we saw in the sedan sibling of the hatchback. Starting with the instrument cluster, where we have a TFT display providing all the vital information. Getting to the tech features; model comes a seven-inch touchscreen with company’s MyLink Software. It enables the user to easily access the Apple CarPlay and Android Auto with Bluetooth connectivity. Apart from these another notable aspect is the lots of space. Even at the rear the passengers get lots of legroom while the cargo space remains uncompromised. 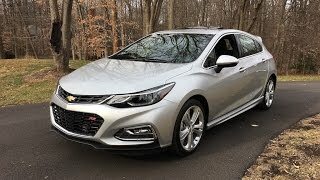 Thus rounding up the interior details of Chevrolet Cruze Hatchback 2017 I’ll say, it is a, impeccable amalgamation of technology and spaciousness. 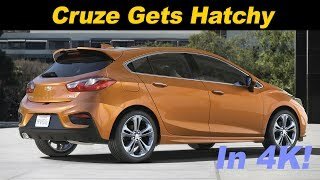 The exterior of Chevrolet Cruze Hatchback 2017 is handsome with its new integrations. Starting with the front fascia, we have the traditional grille sitting amidst the aggressively designed lights. You can notice sharp creases running through the bodyline. The same makes the hood; fenders and doors look bit sportive. At the rear end the slanting glass complements the taillights. The spoiler over the rear glass and the shark fin over it make the model look sportive. The bumper gets the black color with that metallic exhaust outlet adding to the gleam. Thus rounding up the exterior details of Chevrolet Cruze Hatchback 2017 I’ll call the design language smart and sportive. The package indeed takes the hatchback lap ahead of its predecessors. 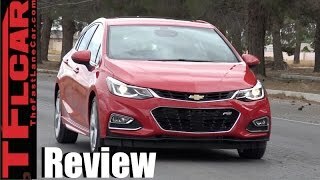 Beneath the hood of Chevrolet Cruze Hatchback 2017 sits a revised 1.4 liter turbocharged four-cylinder engine cranking total output of 153 hp and peak torque of 240 nm paired to six-speed manual or a six-speed automatic transmission. With this power rolling the wheels, top speed of Chevrolet Cruze Hatchback 2017 touches the mark of 125 mph while the 0-60 mph sprint can be knocked in 8.0 seconds.